Body Language & Emotional Intelligence: Nonverbal Communication Analysis-Test # 2194: Romney-Ryan Tattoo on Face - But What Does His Body Language Say? But What Does His Body Language Say? 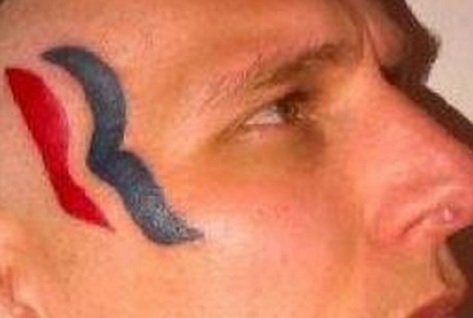 Eric Hartsburg of Michigan City, Indiana had a Romney-Ryan tattoo on the side of his face (on his right temple region and just anterior) earlier this year. He reportedly was paid $15,000 to do so. After watching this interview, what does his body language tell you? Do you believe his nonverbal signals indicate sincerity or insincerity? One should always ask, "Is their nonverbal communication consistent with their verbal message?" Are his eyelid movements consistent with truth? What about his forehead? His mouth? What you don't know, you won't look for - and what don't look for, you will not find.